This is the first time Marine Harvest has sued Morton for anything she has previously said or done. One possible explanation for this legal action is that her “Operation Virus Hunter” aboard the Sea Shepherd’s RV Martin Sheen this summer may actually be harming the industry. Corporations only trouble themselves with individuals when they’re feeling threatened. The salmon farming industry has heretofore responded to Morton’s solid science and legal victories with either silence or court appeals — and, probably, with political lobbying. 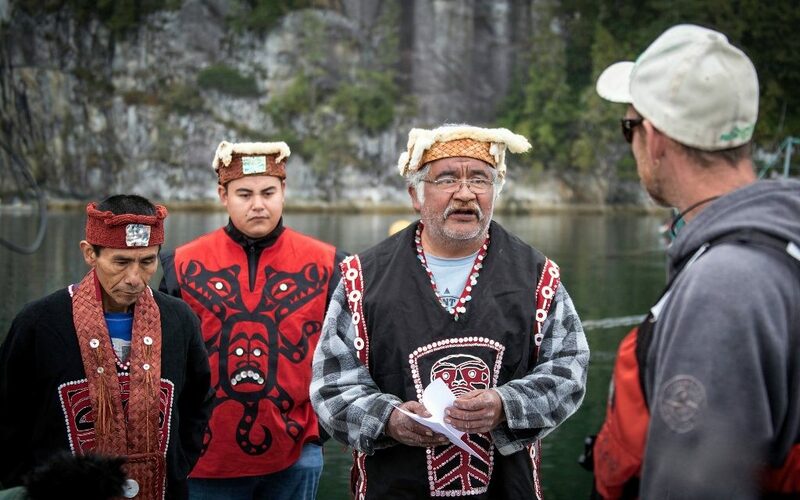 Was the presence on their Broughton Archipelago salmon farms of stern and resolute First Nations chiefs and elders with eviction notices too much to disregard? These sites represent about one-third of the industry’s total, and their loss would be an existential threat. 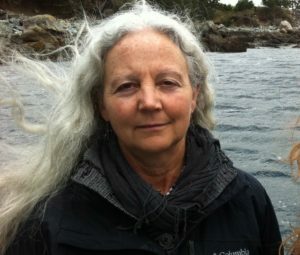 Biologist Alexandra Morton, has been studying the ecological impacts of salmon farming since the 1980s. She is the only named person in Morton’s lawsuit. There is no indication that Morton incited the Musgmagw Dzawada’enuwx. The presence of the RV Martin Sheen simply became a platform for them to gather, discuss and focus the latent frustration and resentment that has been building against salmon farms for nearly 30 years. If they were encouraged by Morton’s findings that 39% of their local wild salmon were being killed by sea lice emanating from nearby salmon farms, then the court may accept their action as justified — a “salmon people” without their salmon face cultural genocide. The virtual parade of chiefs, elders, women and children, who either identified themselves or were photographed on the salmon farms, were designated by Marine Harvest as “John Doe, Jane Doe, and all other person’s unknown…”. But they are known persons. And the defence they presented reverses the issue of trespass. How could they be trespassing if the salmon farms were the trespassers? If Morton is guilty of trespass, are all the others also guilty? On this point, the evidence in the suit could expand to involve issues of aboriginal land claims, unceded territory, social justice and justifiable self-defence against a mortal threat to an entire aboriginal culture. Undoubtedly, the suit will expose the darker secrets of the salmon farming industry, so even a win may be yet another loss. This entry was posted in Ray Grigg, Philosopher by SpeakToTheWild. Bookmark the permalink.